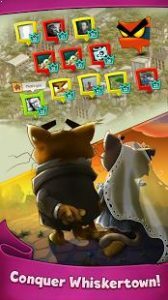 Cats Empire : Have you got the skills to lead a clan of sneaky but fluffy kitties to paradise, where infinite fish await? Cats Empire is the unique mix of strategy and simulation games, where you aim at taking over Whiskertown in PvP mode – Cat vs Cat and Clan vs. Clan! Will you create a mighty clan of furry cats that will take you to the peak of the leaderboard? Raid other clans to take their fish and charms, then head back to your tribe. Heal your kitties and enjoy the fish they stole. Upgrade your plushy predators to improve their individual skills, collect and craft items to boost your tribe’s power, and soon you’ll be running the show in the concrete jungle! Individualize the skills of each plushy cat. Some cats you’ll want to train as stealthy fish-stealing machines. Others you’ll mod into fearless attackers who’ll bring home charms to grow your tribe. You can even cross-breed your kitties to create a clan of powerful super cats with the strategy and skills you need to succeed. Strategy is the name of the game when you’re clawing your way to the summit of the leaderboard! You’ll need to be a cunning cat commander to keep your furballs fighting fit. Brace yourself for some challenging boss fights, unlock new areas to explore, and discover new clans to loot! There’s always a new clan on the block, so you’ll need to protect what’s yours to claim your place as King at the top of CATS EMPIRE! Somewhere between Match-3 and Puzzle games: with the right tactics you will survive the battle within the urban jungle. But only the smartest fish thieves will survive! Grab your mobile and look after your plushy cat tribe. Do you have the superior reflexes and skills needed to lead your fish thieves through the puzzle-ridden backyards of mysterious Whiskertown? Give your tribe members individual skills, crossbreed them and raise your own plushy predators! But caution: if you don’t care enough, you’ll lose them forever. You’ll only be strong if you have friends. Found your own plushy cat empire and form a dangerous army of feline cats. Loot your neighbours and become the boss of Whiskertown’s backyards. Grow your cat tribe and be the wise leader of your sneaky but plushy cat clan. Do so by collecting fish, charms and skill points to improve your clan’s power. Lead your cat tribe and become top of the notch! Win valuable in-game prizes in worldwide tournaments and reach the top of the fish tower. Every competition lasts for 72 hours. The right appetite for fish and charms will lead you out of the whale’s belly to the top of the fish tower. You decide whether you want to go down this road alone or in a clan with your friends. Collect skill points, upgrade your sneaky cats and crossbreed them to get even more lovely super cats! Your cat tribe will soon include indisputable hero cats. Items, fish and charms – Cats are busy gatherers and thieves and progress is made with the right plunder. Steal them from your neighbours or master mysterious backyards. Every successful attack grants you needed skill points or charms for your storage. Play solo against the whole Whiskertown and loot your neighbours or join alliances with your friends and celebrate a hostile takeover. Play on Facebook and collaborate with other plushy predators. Cats Empire is a free-to-play multiplatform game. Play with your friends on Facebook or on your mobile device. You’ll only survive the contest for fish and charms with the right strategy and by mastering the unique mix of puzzle and simulation. Great game, at first I wasnt sure about it, but its a game that once you start you dont want to put it down.